Palestinians are angry over Israel's new security measures at the entrance of the Al Aqsa compound. The measure come after 2 Israeli officers and 3 Palestinians were killed in a clash last week. Israel has removed controversial security measures surrounding Islam's third-holiest site in Jerusalem, but the situation remains tense, and threatens to erupt at any moment. TRT World's Andrew Hopkins's exclusive interview with the Palestinian Ambassador to Turkey, Faed Mustafa. As Palestinians return to worship at Al Aqsa, more than 100 people were injured fighting the Israeli police since the July 14 protests began. It follows Israel's decision to remove the security measures from the entrance to the holy site. . Kisha Ferguson reports. At least 14 Palestinians were injured in clashes with Israeli forces near Al Aqsa Mosque in Jerusalem. Tensions are high after Israeli authorities installed metal detectors at the mosque's entrance. Clashes have continued between Israeli security forces and Palestinian protesters as Israel insists it will keep intact metal detectors installed at the Al-Aqsa mosque. The metal detectors were put in place by Israel last week after a fatal shooting incident at the mosque. Christine Pirovolakis has the story. We spend a day with Janna Jihad, an 11-year-old journalist living in Palestine. This is the occupation through her eyes. Israel is insisting on keeping metal detectors outside the gates of the Al Aqsa mosque, despite continued protests. But it says it could eventually reduce their use. At a cabinet security meeting on Sunday, Prime Minister Benjamin Netanyahu said the security measures are being assessed. Nafisa Latic reports. 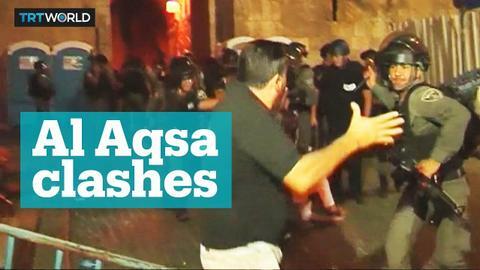 Why is Al Aqsa at the heart of the Israeli-Palestinian conflict? 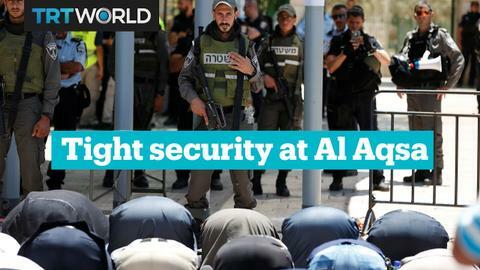 Al Aqsa compound in Jerusalem is at the heart of the Israeli-Arab conflict, but what makes it so important? Palestinians are angry over Israel's new security measures at the entrance of Al Aqsa compound. The measures come after 2 Israeli officers and 3 Palestinians were killed in a clash last week.